Thank you Paula, I’m so glad you enjoyed it. 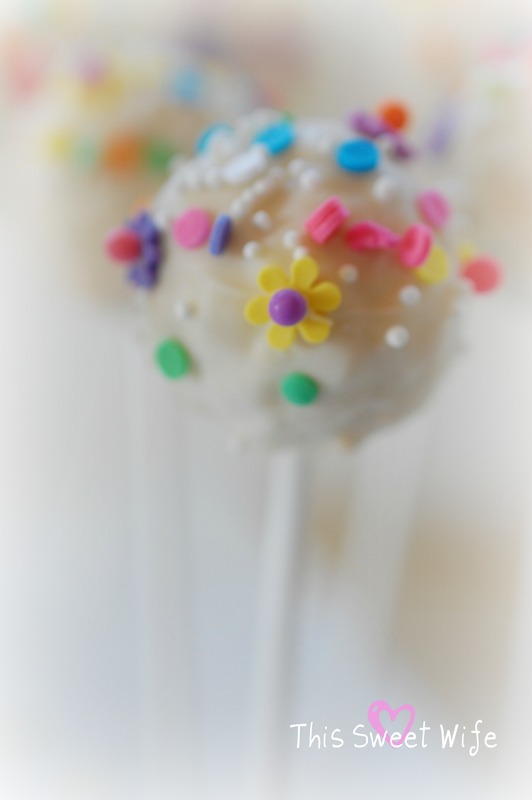 You’re right the pops would be terrific dipped in pretty pastels or chocolates:) I’m working on a fun post that expands on the cakepop idea using candy molds and pastels right now:) and can’t wait to share it with you. Hi Kammie, This recipe makes approximately 3 dozen, 1 1/2 inch pops. Your directions don’t say anything about when to put in the marshmallows. When do you put them in? Hi Kammie, Sorry about that. Once the butter has melted, add the vanilla and then the marshmallows. Stir continuously until they’re all melted. I’ll add a reminder that at this point it’s important that you keep your heat low so they don’t burn. Good luck. Hi, It’s my dads 80th birthday and hes having a family party so i thought i’d give these a go (his grandchildren will adore them), What I need to know is, how long will they keep once made? Hi Lynda, In my experience, these pops are best served in 1-3 days for the freshest taste. If you’re not serving them the same day, I would suggest sealing them in food wrap or an airtight container. This recipe makes 5 1/2 dozen pops. I originally thought they made 3 dozen but the last time I made them I was careful to count and ended up with 66. I hope you have a wonderful party! What a great idea! I was thinking of making these and sending them to my kids and grandkids. I’ll have to find a good sealing container to keep them fresh.